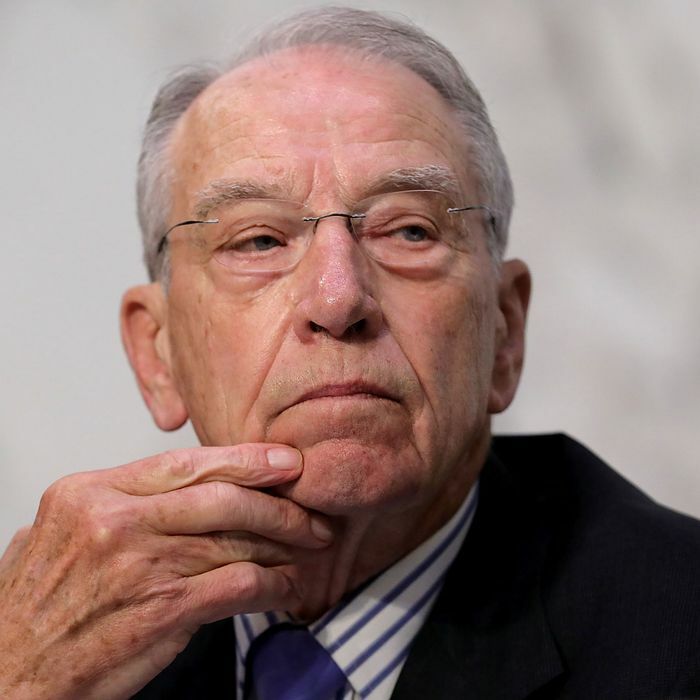 Garrett Ventry, a communications aide to Chuck Grassley on the Senate Judiciary Committee, resigned on Saturday morning after NBC News asked him about a sexual harassment allegation in his past. Ventry had been helping direct the strategy to steer Brett Kavanaugh’s Supreme Court nomination after Christine Ford came forward to accuse him of sexual assault. In addition, Ventry worked at a public-relations firm that was involved in crafting a widely publicized (and mocked) theory that Ford had identified the wrong man 36 years ago; Ventry also resigned from that company on Saturday. Sources familiar with the situation said Ventry was let go from Bell’s office after parts of his résumé were found to have been embellished, and because he faced an accusation of sexual harassment from a female employee of the North Carolina General Assembly’s Republican staff. The spectacle of a Republican staffer on the committee quitting over such allegations would be uncomfortable enough on any given day. But it looks particularly unseemly considering the drama playing out around Kavanaugh and Ford, and given Ventry’s associations beyond the Judiciary Committee. Ventry — who maintains an active social media presence and frequently speaks with reporters — also worked at CRC Public Relations, a prominent GOP firm known for helping to “swift boat” John Kerry in 2004, in one of the more ignoble attack campaigns in recent decades. On Friday, Politico reported that the company had worked directly with Republican judicial activist Ed Whelan to concoct a bizarro theory that Ford had mistaken Kavanaugh with another classmate her high school, who bore a resemblance to the judge. That thesis, which had been hinted at as providing incontrovertible evidence of Kavanaugh’s innocence, backfired spectacularly. Gentry said that the Senate Judiciary Committee had no prior knowledge of Whelan’s strategy, but questions continue to swirl about who did. CRC said on Saturday that Ventry had been on hiatus from the firm, but that it had accepted his resignation. But these hurdles are ultimately sideshows to the big question: whether Christine Ford agrees to testify.